What are the effects of smartphones on the brain? Given the prevalence of smartphones today, it is a question of interest for healthcare practitioners, mental health professionals, educators, parents, and anyone who happens to use a smartphone on a regular basis. If you were asked to go a day without your smartphone, do you think you could do it easily? Researchers who have asked participants to go without their phones for various periods of time have found that breaking the technology habit, even for a relatively short interval, can be exceedingly difficult. Walk into any public venue and you will probably find people using their phones for a variety of purposes, from conducting business calls to checking their email to updating their Twitter. Our phones have become an inextricable part of our lives. But does this reliance on smartphones have any impact on our brains? Recent research suggests that smartphone usage does indeed have an effect on the brain, although the long-term effects remain to be seen. In one study presented to the Radiological Society of North America, researchers found that young people with a so-called internet and smartphone addition actually demonstrated imbalances in brain chemistry compared to a control group. Another studying appearing in the Journal of the Association for Consumer Research found that cognitive capacity was significantly reduced whenever a smartphone is within reach, even when the phone is off. In the commentary appearing in the journal Pediatrics, researchers from the Boston University School of Medicine took a closer look at the available literature on smartphone and iPad use among very young children. Using such devices to entertain or pacify children, they warn, might have a detrimental effect on their social and emotional development. “If these devices become the predominant method to calm and distract young children, will they be able to develop their own internal mechanisms of self-regulation?” the researchers question. Hands-on activities and those involving direct human interaction are superior to interactive screen games, the experts suggest. The use of mobile devices becomes especially problematic when such devices replace hands-on activities that help develop visual-motor and sensorimotor skills. The researchers note, however, that there are still many unknowns about how the use of mobile devices influences child development. They question whether overuse of smartphone and tablets might interfere with the development of social and problem-solving skills that are better acquired during unstructured play with interaction with peers. In a study published in the Proceeding of the National Academy of Sciences, a dozen adult participants were asked to either read on an iPad for four hours each night before bed or read printed books in dim lighting. After five consecutive nights, the two groups switched. What the researchers discovered was that those who had read on an iPad before bedtime displayed a reduction in levels of melatonin, a hormone that increases throughout the evening and induces sleepiness. It also took these participants more time to fall asleep, and they experienced less REM sleep throughout the night. The culprit? The type of blue light emitted by most mobile devices. The cells at the back of the eyes contain a light-sensitive protein that picks up certain wavelengths of light. These light-sensitive cells then send signals to the brain's "clock" that regulates the body's circadian rhythms. Normally, blue light peaks in the morning, signaling your body to wake up for the day. Red light increases in the evening, signaling that it is time to wind down and go to bed. By interrupting this natural cycle with the blue light emitted by mobile devices, the normal sleep-wake cycles are thrown out of whack. "There's a lot of skepticism out there; a lot of people think this is psychological," explained one of the study's authors, Charles Czeisler. "But what we showed is that reading from light-emitting, e-reader devices has profound biological effects." 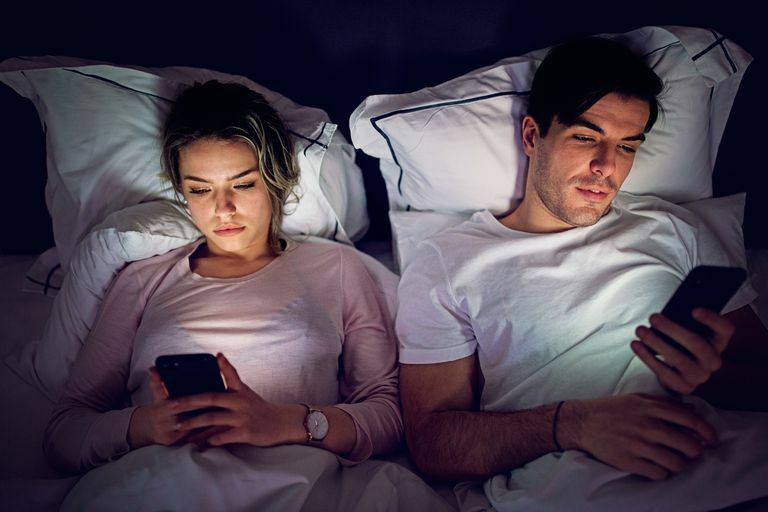 The next time you’re tempted to play with your mobile device in bed, think about the possible effect this might have on your brain and your sleep and consider picking up a paperback book instead. Mobile devices don't just offer distraction these days. You no longer have to memorize phone numbers or keep a Rolodex on your desk—all that information is neatly stored on your phone’s contact list. Instead of mulling over questions you might have about the world around you, you can just grab your phone and Google the answers. Instead of trying to remember important appointments, meetings, or dates, you simply rely on an iPhone app to remind you of what you need to accomplish each day. And some experts warn that this over-reliance on your mobile device for all the answers might lead to mental laziness. In fact, one recent study has found that there is actually a link between relying on a smartphone and mental laziness. Smartphones don't necessarily turn people from deep thinkers into lazy thinkers, but it does suggest that people who are naturally intuitive thinkers—or those who act based on instinct and emotions—tend to rely on their phones more frequently. "The problem with relying on the Internet too much is that you can't know you have the correct answer unless you think about it in an analytical or logical way," explained Gordon Pennycook, one of the study's co-authors. Barr, N., Pennycook, G., Stolz, J. A., & Fugelsang, J. A. The brain in your pocket: Evidence that smartphones are used to supplant thinking. Computers in Human Behavior. 2015;48:473-480. doi:10.1016/j.chb.2015.02.029. Ward, AF, Duke, K, Gneezy, A, & Box, MW. Brain drain: The mere presence of one's own smartphone reduces available cognitive capacity. Journal of the Association for Consumer Research. 2017;2(2):140-154.